Mix all 3 ingredients together, form into balls, place on cookie sheet and smash with fork. Bake at 350 degrees for 7-8 minutes. 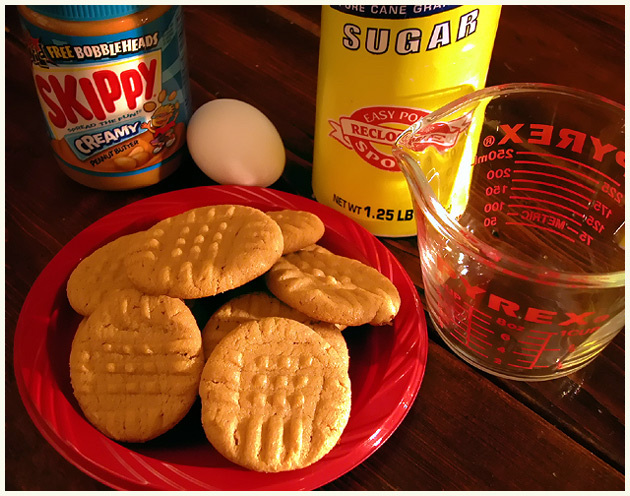 This is my favorite cookie recipe and I was going to use it for the current challenge! You beat me to it! Great lighting; it really shows off the signature shape of peanut butter cookies. Good use of color. What can I say? It's beautifully done in presentation, clarity and composition. Meets the challenge very well! Oohh I'll be trying this one. Nice shot. Look delicious. Nice lighting and composition. 6. Great composition....wonderful clarity, good color and lighting. I use this recipe frequently. My family calls them cuppa cuppa cuppa cookies. The lighting seems a little harsh or off. Maybe try bouncing it onto the subject, rather than shining on it directly. It meets the challenge, and technically is fine, however it could be presented in a more attractive way. Eg: a nice plate instead of plastic, and perhaps having the indgredients measured out instead of in their commercial containers. Just my preference of course. Nicely setup. The red plate really adds color to this shot. I'm giving a 10. My only comments would be that I think the grouping is a little too tight. But who knows.... I'm comfortable with it. Nice colors and light, well done! Looks tasty too! I made some of these cookies this evening too! Wonderfully easy recipe. The color of the cookies is good, although the light on them seems a little uneven with more on the front than the back, which also makes the peanut butter container a little in the shadow too. Compositionally it doesnt really feel that balanced, perhaps it is the jug that's throwing it off some. The angle on the cookies is good, although it looks a little off on the containers. Proudly hosted by Sargasso Networks. Current Server Time: 04/18/2019 08:23:48 PM EDT.